CD review: " Time Being"
Canada's Ron Sexsmith is one of those musicians who just won't fit neatly into any of the existing categories. Pop? Folk? Singer-songwriter probably fits better than any other label, although that's more of a description of the creative process than of the resultant music. 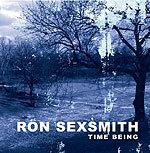 Like most musicians who don't really fit into the ready-made slots, Sexsmith's music is far more interesting than that of most Top 40 acts  a trend that holds true on his latest release, "Time Being." Possessed of a warm, slightly nasal and utterly charming singing voice that reminds more than a little of Paul McCartney, Sexsmith also writes quirky little songs that reside somewhere between the pop-folk of James Taylor's generation and the power pop of the '80s and '90s. The instrumentation, arrangements and performance are generally more folkish than rock or pop, particularly when you consider his consistently clever workplay with the lyrics. And Sexsmith is a decidedly low-key, restrained singer. But his compositions themselves are so perfectly constructed that they can't help but draw comparisions to the best pop songs of the rock era. On his new CD, all of the above combines to create another collection of unforgettable songs given a lovely patina by Sexsmith and his band.